Time to push to a new stage. 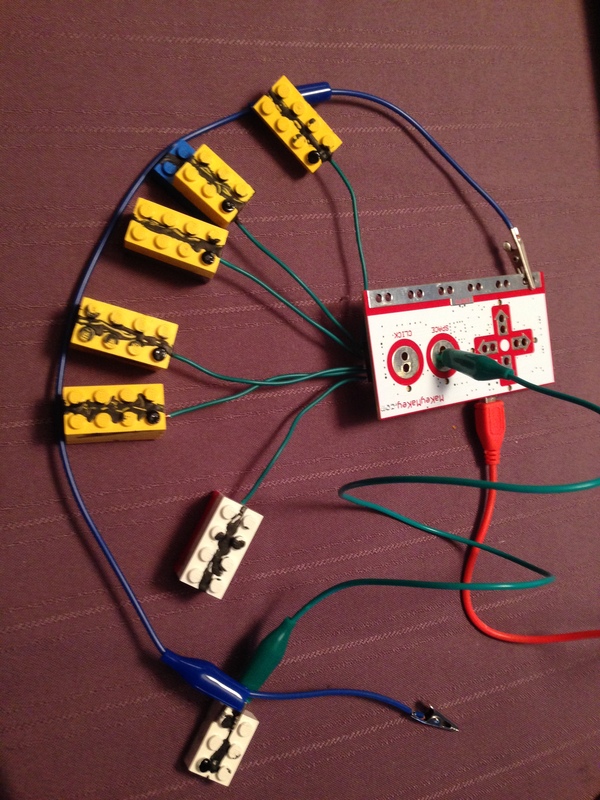 The key connections from the MaKey MaKey are limited, but computers do more than just type. 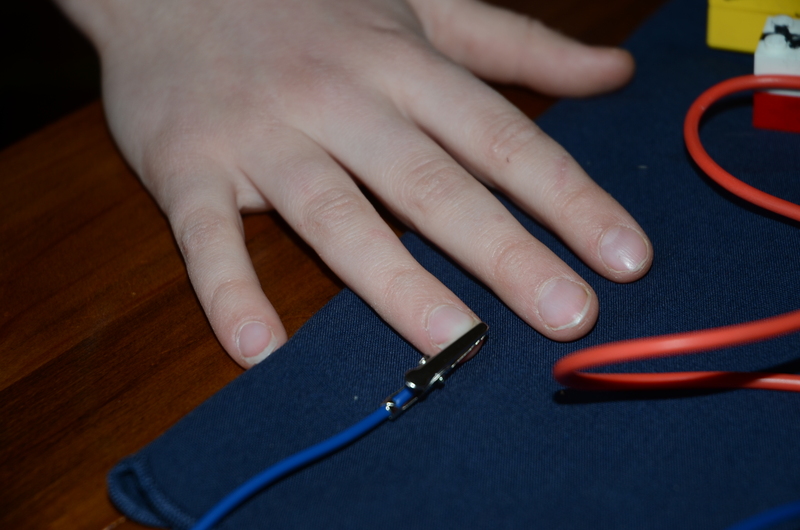 The MaKey Makey converts any conductive object into a computer key or mouse click, so anything that can be controlled or activated by a computer can be controlled or activated by the MaKey MaKey. I downloaded a MIDI piano keyboard from VPMK (virtual piano midi keyboard), and adjusted the keyboard map so that the keys on the MaKey MaKey (w,a,s,d,f,g and space) corresponded to middle C and the central musical octave on the piano keyboard. So I showed my son that he could make music with the MaKey MaKey, and and then asked him that question. The answer was “Lego”. He already understood that the device only works with conductive objects, so with a tube of conductive paint, he was on his way. The results are below. Once he had it built, he wanted to play some music. Here was another problem to solve. He realized that he had wired the board backwards The Lego “keys” were opposite to the traditional keyboard that he was used to, so that the Lego “key” on the left played the highest note instead of the lowest. I suggested rewiring it with longer wires so that we could rearrange the keys. 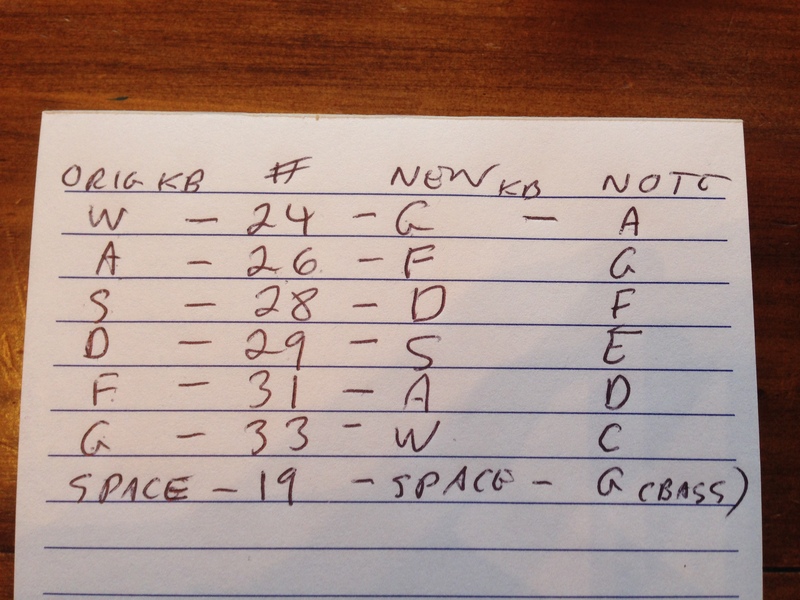 He suggested instead that we remap the keyboard so that the notes are in the same order as the blocks. So we did, carefully noting the original positions and the changes that we made. And ready to play! Of course, once you’ve made something good, others want to get in on the act! His younger sister was just as intrigued by the musical notes that he had made, and tried out her own version!